Some rights reserved by Alaskan Dude. 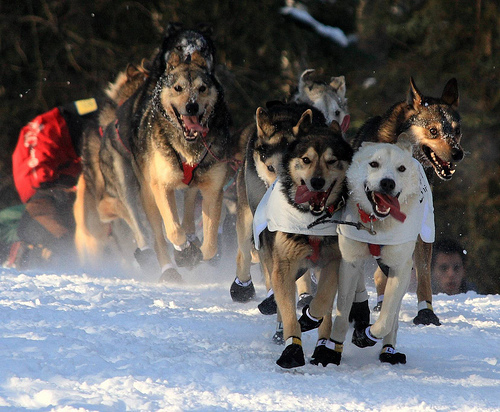 Dogsledding is the official state sport of Alaska, and Alaskans are very passionate about the sport and the dogs that compete alongside their two-legged companions. However, many people outside of the 49th state are unfamiliar with the sport. Here are six interesting facts you may not know about dogsledding that may intrigue you enough for you to go to try it out for yourself on your next visit to one of our Princess Lodges. 1) Alaskan Huskies are the most commonly used breed of sled dog in the Great North today, not Siberian Huskies as many assume. Today’s modern Alaskan Husky has an indigenous genetic base that is a mix of two main types of native dogs. This crossbreed between any of the pure, northern canine breeds and other types of dogs is the result of many generations of purposeful breeding that began in the late 1800s. 2) Dog sleds were heavily used by Alaska Natives throughout history, but this mode of transportation became most famous during the 1925 diphtheria outbreak in Nome. The closest town with enough serum for Nome’s residents was 700 miles away and inaccessible except by dog sled. A dog sled relay was set up by the villages between Nenana and Nome, and 20 teams worked together to relay the serum to Nome in six days. 3) As the need for greater endurance and running efficiency grew, lighter breeds of dogs were introduced to the genetic lineage of sled dogs. These sled dogs can outrun almost anything on four legs over distances greater than 50 or 60 miles. 4) As dogs are not driven with reins but by spoken commands, the leader of the dog team must understand all that is said to him and guide the others accordingly. An intelligent dog leader is therefore an absolute necessity and truly man’s best friend in the sport. 5) Once trained, sled dogs can remain in top form for years. It’s not unusual to see 10-year-old dogs in races. 6) Freight and long-distance running dogs should have dense, warm coats to hold heat in, and sprint dogs have short coats that let heat out. Most sled dogs have a double coat, with the outer coat keeping snow away from the body, and a waterproof inner coat for insulation. There are endless opportunities to experience the thrill of dog mushing, and they are not limited to a particular season. In summer, visitors can dogsled along well-traveled trails on wheels or take a helicopter ride to a glacier for the once-in-a-lifetime experience mushing their own sled. Many kennel owners offer rides, tours, demonstrations and a chance to snuggle with precious sled dog puppies. Others create custom overnight and multi-day tours that allow visitors to become the driver and experience firsthand what it’s like to be an Iditarod Race dog musher. Follow these links to just some of the groups that offer such tours.